Bandini was director Bimal Roy's last film. And what a swansong. A subtle classic in which Nutan displays an extrordinary ability to illuminate inner conflict; and Roy's richly textured black and white images talk as eloquently as the dialogue. In Roy's many-peaks-few-troughs career, this was an apex of creativity that rivalled his early triumphs like Do Bigha Zameen and Devdas. The wonderfully evocative title Bandini showcases the story of a girl Kalyani bound by love, through all its destructive and redemptive expressions. The film begins with Kalyani (Nutan), a thin cotton-sari-clad bandini in jail. She's outwardly subdued but there is passion obviously raging within her. Roy affectingly recreates the prison atmosphere -- the petty rivalries between inmates, the bossy warden (Chandrima, Rita Bhaduri's mother), and the guard on the prison wall periodically calling out "Sab theek hai", adding to the irony of the inmates' wretched lives. Kalyani volunteers to take care of an infectious patient. Her selflessness (and beauty) wins the attention of the handsome, young prison doctor, Deven (Dharmendra). Intrigued by her, he will not be put off even when he learns that Kalyani is serving a sentence for committing a wilful murder. A flashback takes us into Kalyani's past to pre-Independence India. Kalyani is a young village girl influenced by her well-read, principled father (Raja Paranjpye). Into the village, and her life, comes a revolutionary, Bikash Ghosh (Ashok Kumar). Kalyani is enthralled by the visitor and, to save Bikash's life, even pretends to be his wife. Thereafter, Bikash jilts her and doesn't return to the village. Kalyani's pain at this stage is as much for her derided-by-the-villagers father as it is for herself. For the strong-willed Kalyani, tears or suicide are not feasible options. Jo jaaye woh uspaar kabhie laut ke na aaye. Kalyani will soon cross an invisible rubicon line. The city is unsparingly harsh. She takes up a job at a nursing home, where she has to attend to a neurotic, screeching woman, who humiliates her. Worse, Kalyani discovers that she is Bikash's wife. The dam holding back the quietly-brooding Kalyani's wall of restraint finally collapses when her friend breaks the news that her father had come searching for her in the city and is now dead. Assuming a quietitude contrasted by the cacophony around her, Kalyani resumes her duties and goes to make tea for the shrewish woman. In the background, a welder's torch throws shadows over her as a symbolic hammering beats down upon her. Kalyani reaches for a bottle of hospital poison. Roy's subtextual build-up to, and execution of, this crucial scene is faultless. Deven evidences an eagerness to marry Kalyani having witnessed her expiation for her acts. Her prison term is over. Just as Kalyani is about to board the train that will take her to her new house, she spots a now seriously-ill Bikash embarking on a boat journey, and learns of the circumstances which prompted him to leave her in the lurch. The train and the boat (perhaps standing in for the new and the old) now fight for place in Kalyani's heart as the song of eternal love Mere saajan hai uspaar plays in the background. There is little doubt whom she will choose. Her answer is written all over her face and in the lines: Main bandini piya ki. The scene beautifully captures the headlong abandon of all passion, before and since. Sans screaming hysteria-nics, Nutan puts across one of the finest performances seen on Hindi screen. She recognised and was perfectly in tandem with Kalyani's innate strength of character. Ashok Kumar as the older romanticist and Dharmendra as the symbol of stalwart sensitivity were perfectly cast in their roles. Roy's approach evens out some of the inherent melodrama. Like in his earlier films, Madhumati and Sujata, his visuals are often intertwined with nature. The women prisoners' pain at seeing birds flying freely is portrayed vividly in the song, O pancchi pyaare. Bandini's exploration of the related realms of love, hate, jealousy and redemption make for ever-interesting viewing. * After Bandini, Bimal Roy (who died in 1966) produced Benazir with old favourite Meena Kumari (Parineeta, Yahudi). * Nutan was married and pregnant with Mohnish when Bimal Roy (who had worked with her in Sujata) offered her Bandini. Her performance made the wait worthwhile. * Ashok Kumar was already doing character roles by then but 1963 was a great year for him what with Mere Mehboob, Gumraah, Grihasti and Meri Soorat Teri Aankhen also making it to the marquee. Incidentally, S D Burman came to Ashok Kumar to ask whether Mere saajan hai uspaar was a decent tune. Dadamoni replied in the affirmative. * Dharmendra was still a relative newcomer, having tasted success only in the heroine-oriented Anpadh. 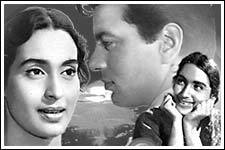 There was some talk of Nutan deciding to opt for Dharmendra in the climax; but it didn't fructify. * S D Burman and Lata had not been working with each other for around half a decade when they recorded Bandini's Jogi jab se tu aaya and repaired the rift in the lute. Lata got to sing the sweet-as-honey love songs like Mora gora ang lai le, while surprisingly it was Asha who had the emotional high-wire songs. * A moved Asha burst into tears when she sang Ab ke baras bhej bhaiya ko babul. * Shailendra's lines throbbed with sentiment. All the songs of the film were written by Shailendra save for Mora gora ang lai le, which marked Gulzar's debut as a lyricist. And yes, as imagery-filled lines like Badli hata ke chanda chhupke se jhaanke chanda evidence, the moon was his muse even then.